The indicator tree reliably blooms a week to ten days ahead of most of the cherry blossoms around the Tidal Basin. Here's how to find it. Not every tree is on exactly the same schedule. Some can be a day or two ahead or behind others. 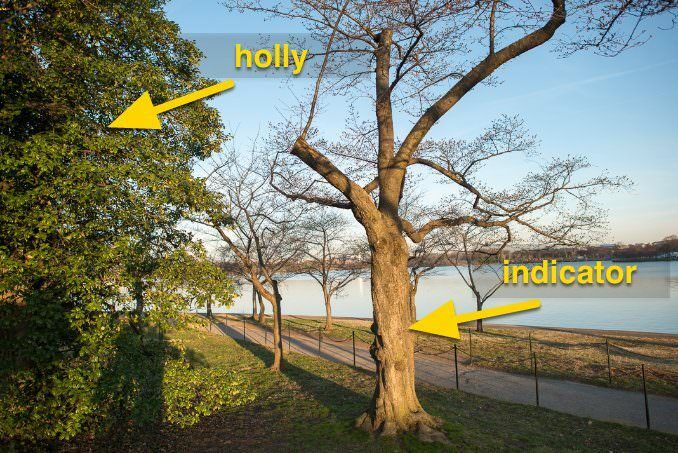 But there's one tree that's consistently a week to ten days ahead of most of the others around the Tidal Basin. Because of this distinctive trait, it has become known as the indicator tree, and it's used to get an idea of where the other trees will be in a week to ten days. It's also one of the key pieces of the puzzle that the National Park Service horticulturalists use in making their peak bloom predictions. So if you're here a little ahead of the peak bloom but still want to see some blossoms, it's a good place to look. There's no sign, though, and unless it happens to be covered in flowers while everything around it isn't, you really have to know where it is. So here's how to find it. 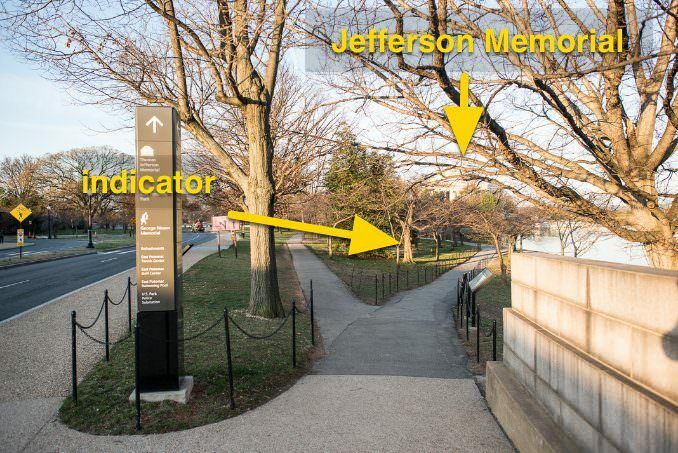 It's located just east of the Jefferson Memorial. You can get to it easily from either the Jefferson Memorial or from the other direction from Ohio Drive SW. This first shot is taken from the end of the bridge on Ohio Drive SW looking southwest towards the Jefferson Memorial (you can see the top of the dome in the background). 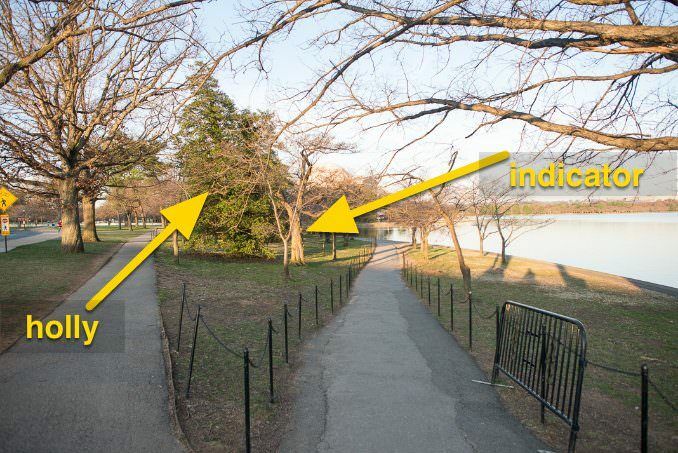 The walkway splits into three, with one path to the left going alongside the road and another path to the right heading towards the water of the Tidal Basin. The indicator tree is between the two paths to the right. It's the first old-looking tree you come across and is standing right next to a large holly tree. It's not the most majestic of the old trees, and it's had some amputations over the years. But for whatever reason, we can count on this particular tree to provide advance warning. The tree ID tag on the southern side of the tree. 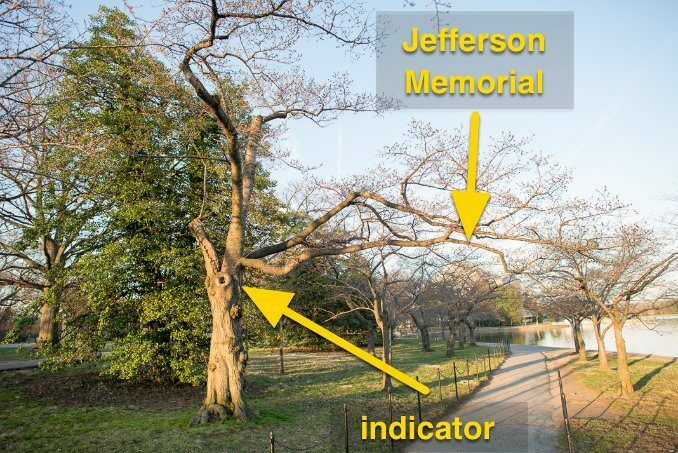 Going to DC next Friday for my husband's birthday and wanted to know how far along the indicator tree is. Any idea? Thanks! I'll be checking in on it sometime in the next few days and will include some shots in one of the posted updates. I haven't been by it in the past week, and there wasn't much to see before that. I visited on 1st March , it seems silence but the florets are visible at different stages . Although this week is cooler , the next is pretty worm , I feel this season the record of March 15 of 1990 may be broken , let us watch and see. On 4th I will like to se the indicator. I will like to visit the Indicator Tree and see what it predicts. Has the indicator tree bloomed yet? Just about to. Some photos from this morning here. They both have a pretty good track record, but based on what I'm seeing down there in recent days it looks like the revised NPS one might be the better bet this year. With the temps forecasted over the East this week and next week, I have a strong feeling that the peak bloom date will be moved up quite a bit! We already have Japanese plum trees and Magnolias beginning to bloom in SE KY!